Hi Darlings, I love being able to share things that excite me, and this is one of those things. 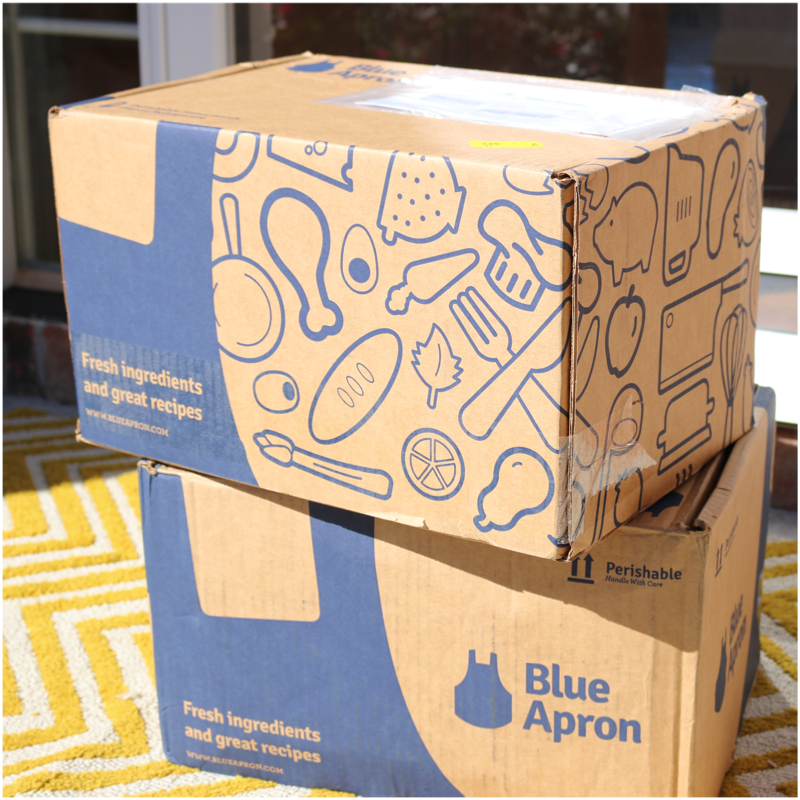 I am fortunate to work with some really great brands but every now and then I get to work with a company that offers a really useful service, and Blue Apron is that service. You guys know how busy my days get and sometimes I just cant even make it to the grocery store which unfortunately means we eat out a lot. 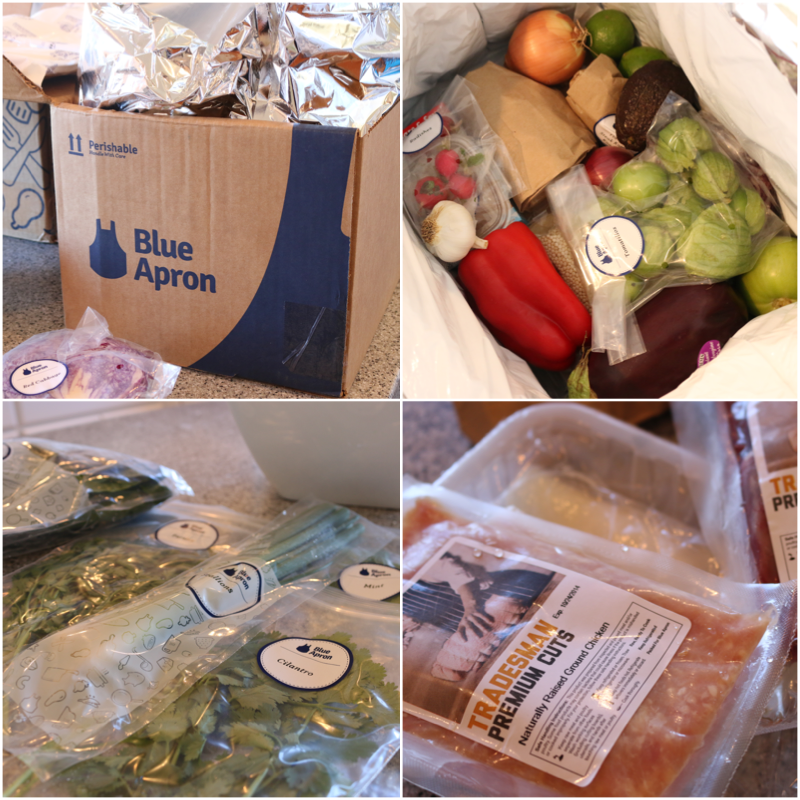 So, when the opportunity to work with Blue Apron came up I was stoked. 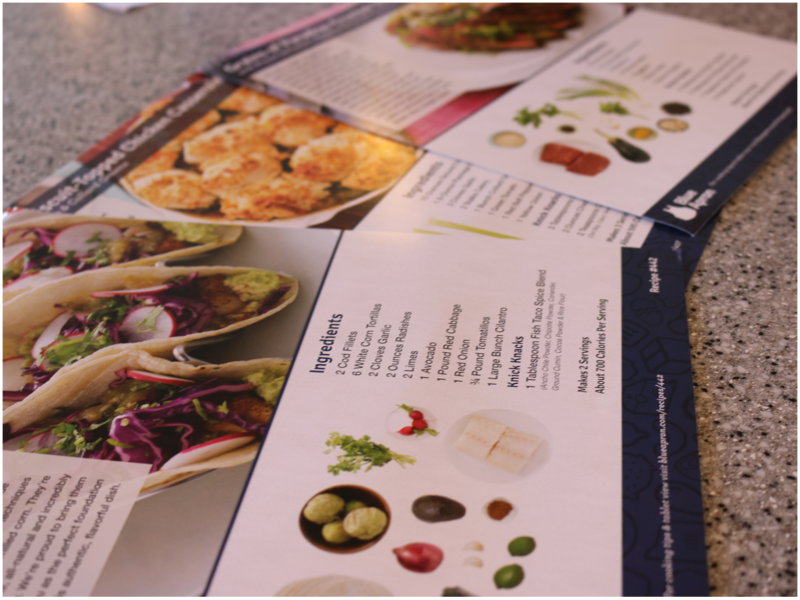 I mean seriously darlings…THREE meals shipped to your home with everything you need to make the dishes, including beautiful recipe cards…..how do you say no to that. This is how it all works, you sign up for the service and every week you get 3 meals delivered to your door in an ice-packed box so cold ingredients stay cold. 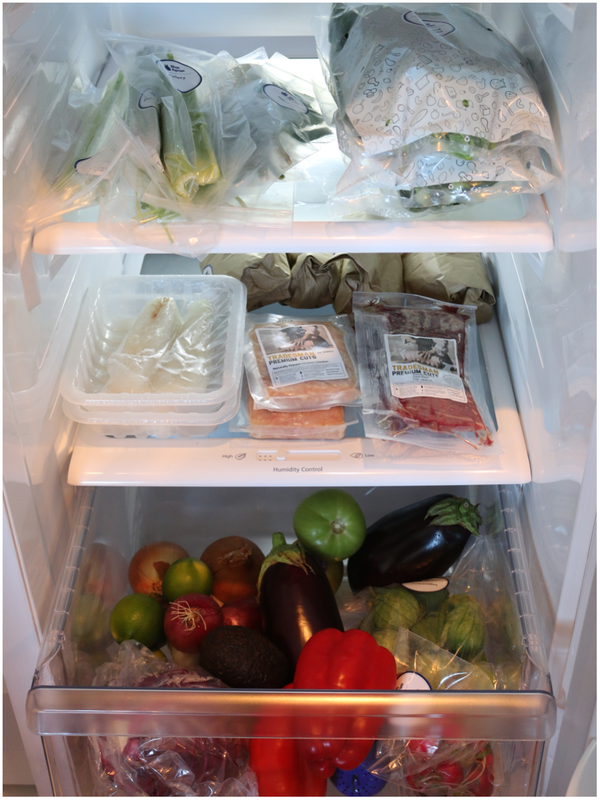 I took everything out of the box and stocked my fridge! It was nice knowing that I had everything I needed to make my family 3 delicious meals that week. I didn’t have to think about what I was making or worry about having to run out to the store. 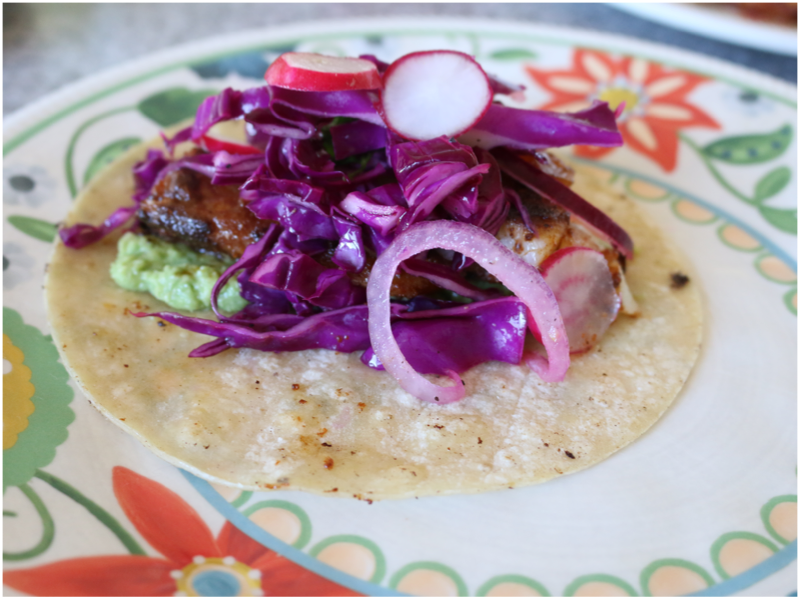 I chose to make the CRISPY FISH TACOS first and they were delicious! The recipe card makes it super easy and I love the guided pics. The really great thing about Blue Apron is that we get to experience new meals we would normally not think to make. No matter how many servings you need for your family everything is pre-portioned so you don’t end up with leftover ingredients that go to waste. Prep time was fast and easy. Everything in the box was carefully labeled so I could grab what you needed front he fridge. 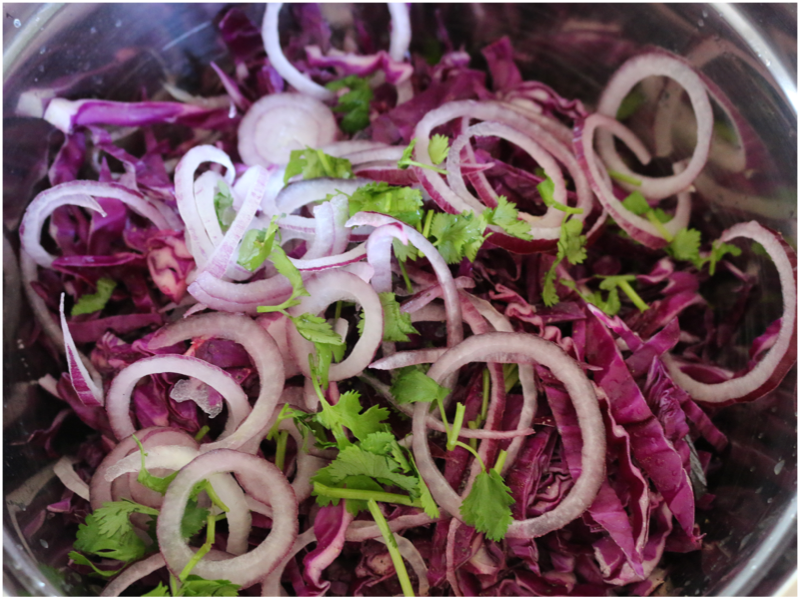 The cabbage slaw with lime, red onion and cilantro was a yummy topping! 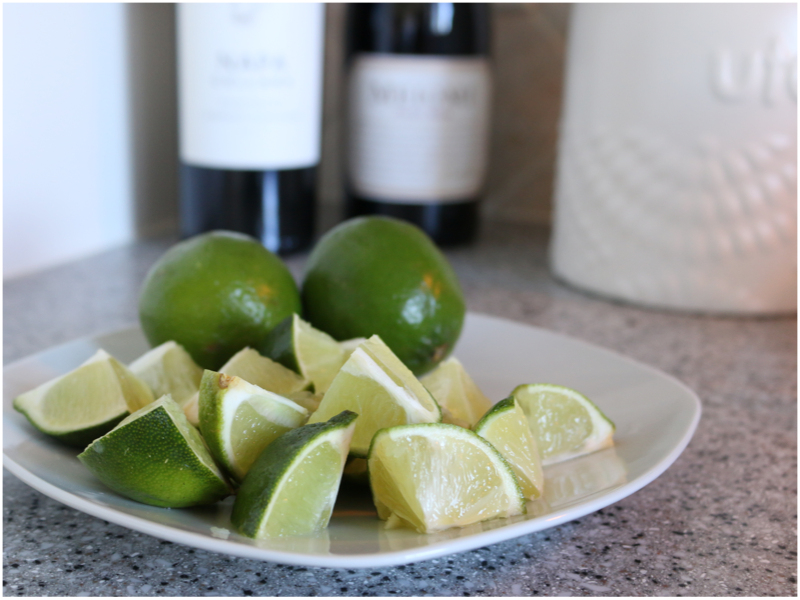 I made it first to let it soak up the lime juice. 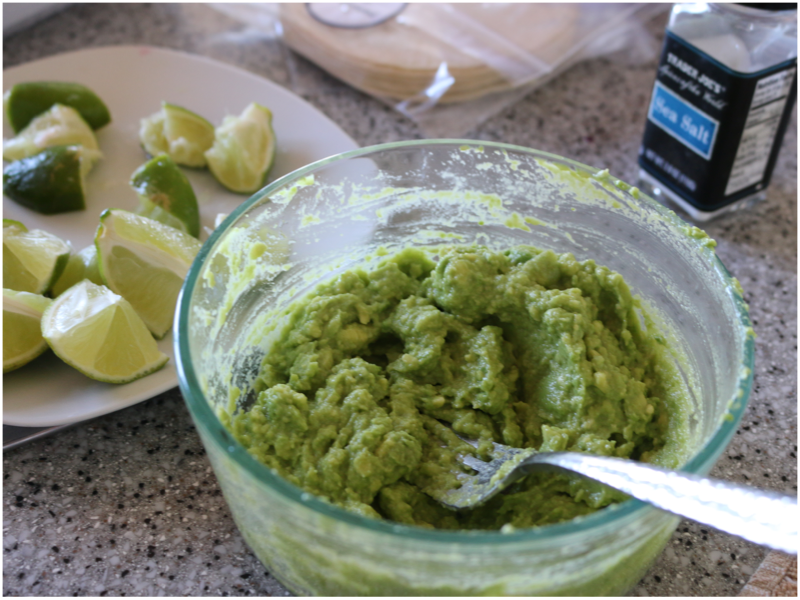 Making the guacamole was super easy and it tasted so good! The avocados were so fresh! 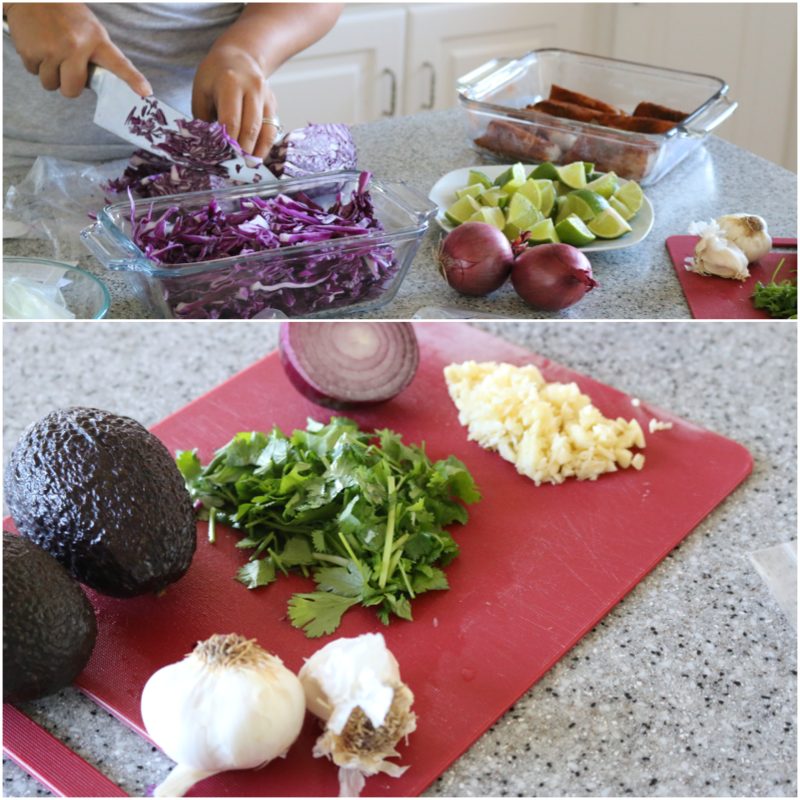 I think I was most excited about making my own salsa verde. 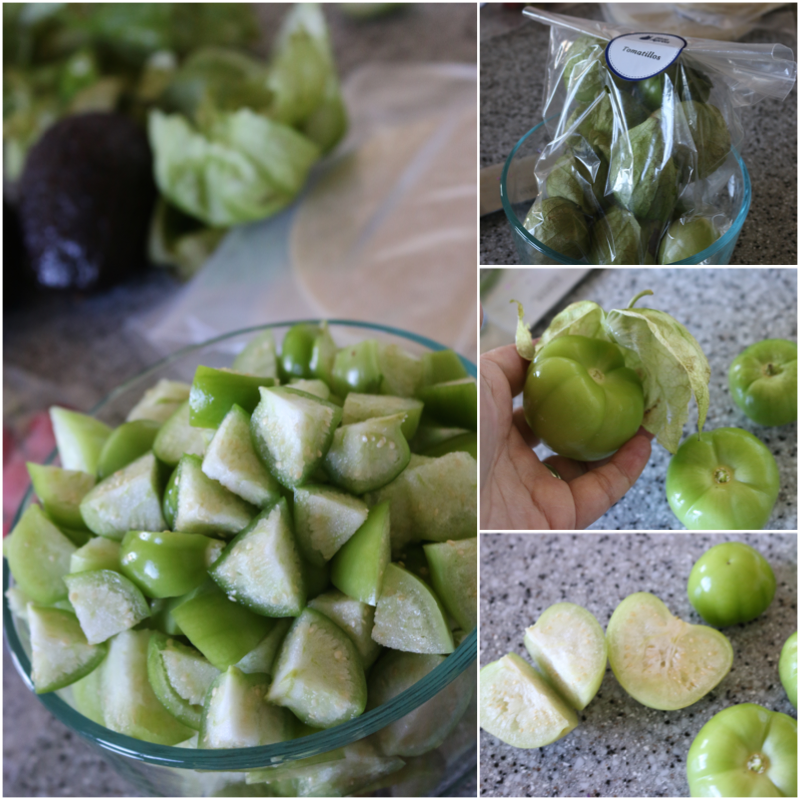 I had never worked with tomatillos before so I really loved learning something new and now I will always know how to make this yummy salsa verde. While the tomatillo sauce was simmering I prepped and made my fish. The fact that they even include the seasoning is just amazing, I didn’t have to worry about a thing. I think this is the most awesome thing that I ever heard of. I may have to try it. 🙁 did you call and see if they can add it? This looks delish! I need to see if its available in my area! My friend recently had surgery and a couple of weeks ago, a group of us purchased 3+ weeks of meals for her to make during her recovery. I got so intrigued by her review that I enrolled in the subscription service myself. I was able to utilize the discount code. Thank you so much! Happy Holidays! Wow… That looks absolutely Yummy Mimi! And Fast & Easy! 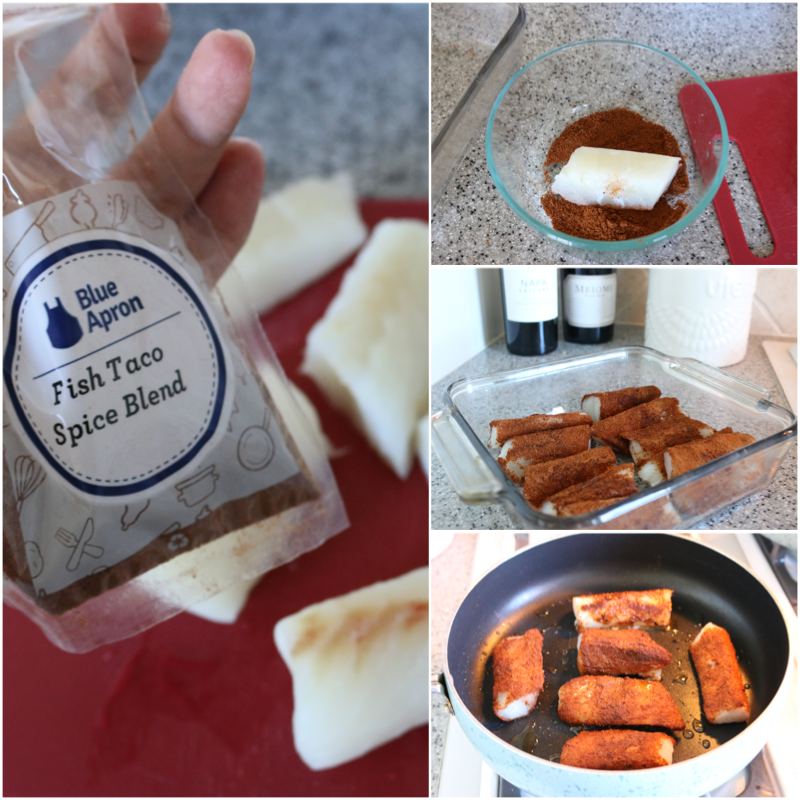 I never heard of Fish Taco’s so I’m going to click on Blue Apron and take a look. This meal and ingredients look amazing. So fresh and delicious, well organized and most important–don’t need to think about a thing. I ordered already. That looks so yummy and easy. Anything to cut down on grocery shopping with a busy lifestyle. Definitely worth checking into BlueApron. Thanks MiMi! I would love to try a service like this one…looks easy, nutritious and delicious. Thanks for sharing MiMi! Looks like something I will look into. stay tuned! I love to cook and I would love to try Blue Apron. Looks interesting. And Fun. 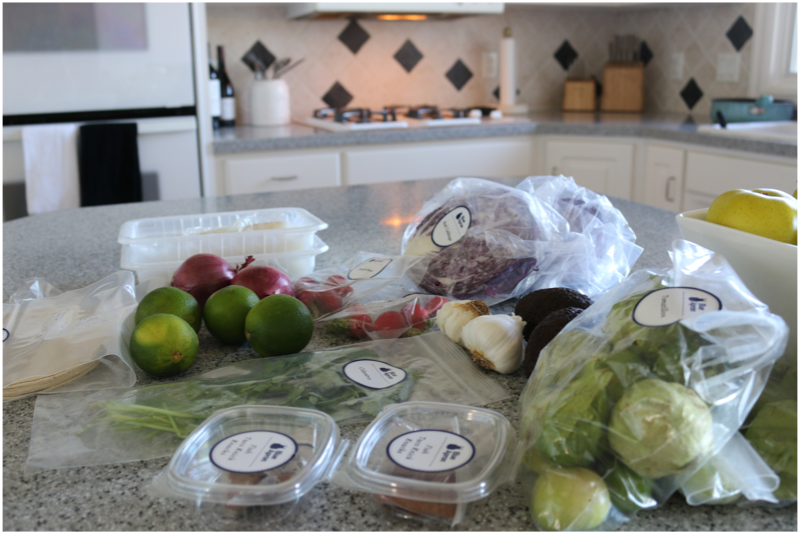 I’ve always wanted to try a meal delivery system such as Blue Apron. It seems like it would make my weekdays much easier! Working full time with a newborn babe and a kindergartner it is sometimes challenging cooking a health nutritious meal every evening. I love how your dish turned out and I will consider giving them a try. I am so glad you did a review on this. I have been interested for sometime and I was not sure about it. I am really going to look into and start at the first of the year. Is the food very favorable? That is my only concern. This sounds like a great idea for me. I have Lupus and some days I’m just too tired to shop and cook. 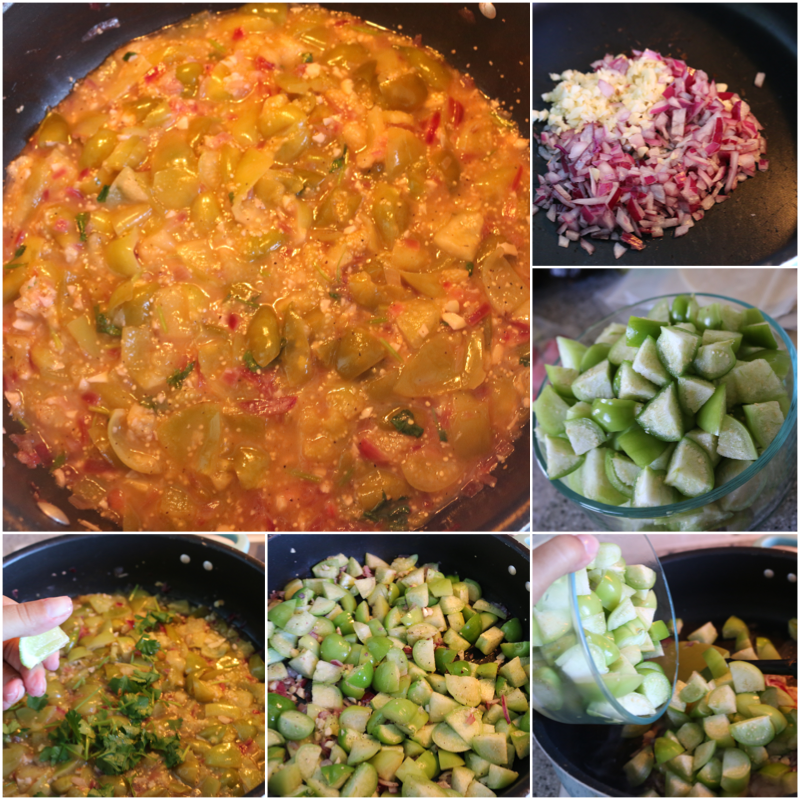 If I could cut out half the work (the shopping) I could concentrate on what I love to do…cook and try new recipes. Thank you for introducing Blue Apron to your followers. This is amazing. Such a time savor and looks delicious! This looks absolutely delicious! I thank you for sharing your life with us. Praying for you & your family to receive the love as you give it. Smooches. Thanks for sharing your review Mimi! I enjoy cooking but I don’t like the process of deciding what to cook. This is the perfect solution! I think that this is wonderful. would save so many moms on time. I wish there was one here in AZ. Everything looks fresh and really good. amazing! As a mom of four it’s seems like a great time saver. Gotta see if it services my area ASAP! Great idea! Never heard of this before. I just started making a weekly dinner menu and this would be a great way to do that. I’ll check it out. I have been eyeing this company on Facebook for a while and I wanted to see someone actually do a video or a review and you did…… Thank you. It looks delicious and I would love to eat like this on a daily basis. I would sooo meet my goal weight before I turn 40 next year. Food looks really good and seem easy to prepare. Thank you for sharing Mimi. I read your posts everyday at 11:00 am EST. Today’s post almost made me change my lunch plans, YUM! This would be a great twist to your channel and an awesome video to incorporate. The food looks amazing, definitely not something I would think would be pary of a delivery service. Worth looking into further. Thanks Mimi. Thanks, for the tip on blue apron, I just put in my order. I’m very excited to see what they send me. It’s just me and my 92 1/2 mother and sometimes I run out of ideas on what to cook, this is going to be a lot of fun thanks MimiG!!! That looks so yummy! Going to the website right NOW! Thanks for sharing! I love to cook and try new dishes. 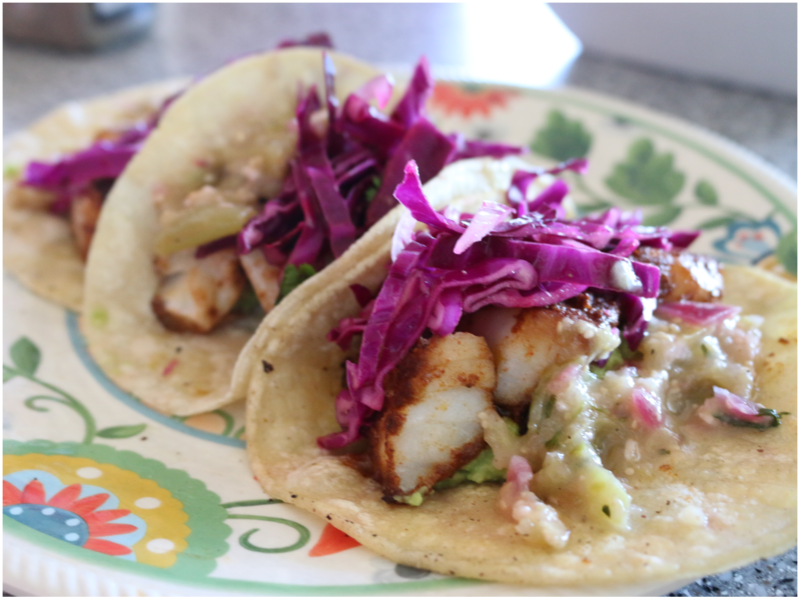 The fish tacos you made look so delicious. I just placed my order and can’t wait to see what Blue Apron sends my way! Thank you for the helpful suggestions. Every busy woman or man need to join this club. My co-worker was telling me about this a few months ago. I’m going to try it after next week since I’ll be traveling and won’t be home to receive the order. I’m definitely going to try it though. Thanks for the review Mimi! The meal looks very fresh and I love fish tacos. I’ve been thinking of trying this. I already get my groceries delivered from the grocery store so why not try this? Just signed up and I was able to use the code. Awesome! every part of it and i also have you saved to fav to check out new information in your website. Is there anyone else getting identical RSS problems? Anyone that knows the solution will you kindly respond? The wow gold seem excellent and are incredibly manner and cozy for everyone. The Foreign Affairs Minister said that officials with certain powers should know that their actions have to be exercised in good faith and for the purposes set out in the Broadcast Act, in a manner consistent with the relevant considerations such as citizens’ rights set out in the Constitution itself.